In a previous post, we looked at why Querétaro has become a hub of aerospace manufacturing, home to major manufacturing or research plants for such firms as Bombardier and GE. In this post we take a further look at the aerospace industry in Mexico, which, according to ProMexico, the Mexican federal agency that promotes trade and investment, has expanded at 17% a year since 2005. Mexico’s aerospace manufacturing, which began as a relatively simple assembly industry, has evolved today into sophisticated aero-parts and fuselage manufacturing, well supported by specialist education and training programs. In the next phase, Mexico is expected to acquire full service airplane assembly meeting all relevant international design and innovation requirements. The shift in aerospace from simple assembly to complex design, manufacturing and research, echoes what has already happened in some other sectors, such as vehicle manufacture. Today, the aerospace industry employs 32,000 people in 16 Mexican states. the four most important states for the aerospace industry in Mexico are Baja California, Querétaro, Nuevo León and Chihuahua. Approximately half the jobs in the sector are located in Baja California, mainly in either Tijuana or Mexicali. The first two aerospace companies to locate in Baja California (in the mid 1960s) were Rockwell Collins and Switch Luz. Today, aerospace firms in Baja California make electronic components, air conditioning systems, cable harnesses, hoses and seals, rustless steel bolts, turbine connector assemblies and blankets for commercial and military aircraft. Honeywell International has been influential in developing aerospace in Baja California since 2007, when it opened a testing facility in Mexicali. 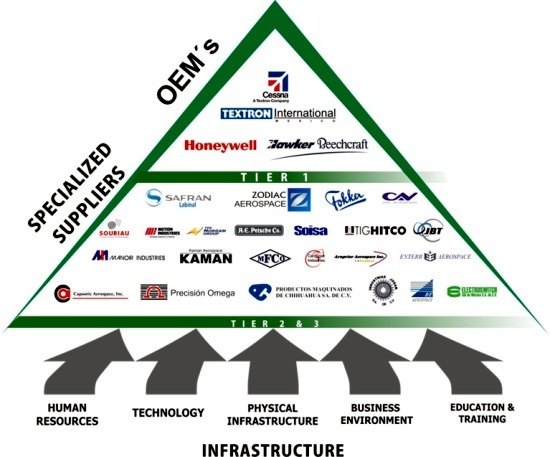 How important is the aerospace sector in Mexico? The number of aerospace manufacturing companies in Mexico is expected to grow from 232 in 2010 to more than 350 in 2015. Exports of aerospace parts were worth $3.1 billion in 2010, a figure expected to jump to $5.7 billion by 2015. Labor costs are not as cheap as India and China, but that is more than compensated by reduced transport costs. Aerospace parts made in Mexico can reach an assembly plant in the USA in 16 hours by road, compared to about 21 days from China by sea. There is a large pool in Mexico of skilled labor, trained for electronics and auto-parts manufacturing. The available evidence suggests that there are now more engineering courses and graduates in Mexico each year than in the USA. The number of engineering graduates in the USA has not risen in recent years, and the number of engineering courses has actually declined. In Mexico, the numbers of engineering courses and graduates have both continued to grow at a very rapid rate. 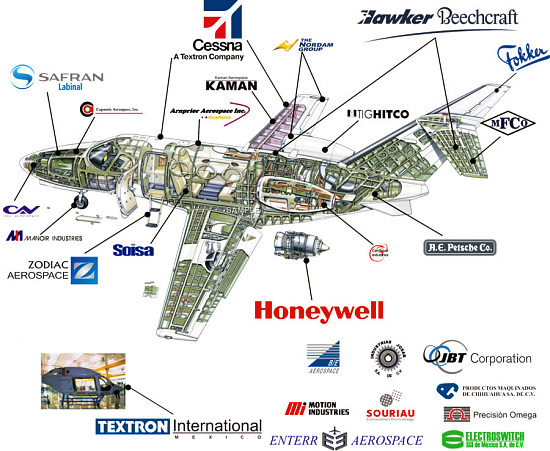 Specialist courses are already training students for the aerospace industry. For example the private university CETYS, with campuses in Tijuana and Mexicali, has added aerospace to its graduate and undergraduate curricula and also offers a Master’s in Aerospace Engineering. Undergraduate programs in aerospace have been introduced at two public universities: the Autonomous University of Baja California and the Tijuana Technological Institute. The Tijuana Technological University has started to train technicians in assembling harnesses for the aerospace industry, modeled on a curriculum developed for a technical school in Toulouse, France (the home of Airbus).